At the annual meeting of the Organization of American Historians this past April, a group of people who knew Julian Bond in different contexts reflected on his life and the man they’d known. Historian Emilye Crosby chaired the “Remembering Julian Bond” panel, and she shares some of the memories from the panel in this blog post, originally published on Process: a blog for American History. Julian Bond made history for the first time as a young activist in the 1960s Civil Rights Movement. He was a founding member of the Student Nonviolent Coordinating Committee, known as SNCC, and was the driving force in the organization’s incomparable Communications Department. In the late 1960s he took his activism into the Georgia legislature and after two decades there he returned to communications, using the skill he honed in the Civil Rights Movement to teach, interpret, and help shape our understanding of the movement that he and others propelled forward. Throughout his life, he made and analyzed history, using his public stature, movement work, and intellectual skills to battle for justice. When he passed away prematurely in August 2015, there was a huge outpouring of love and loss. 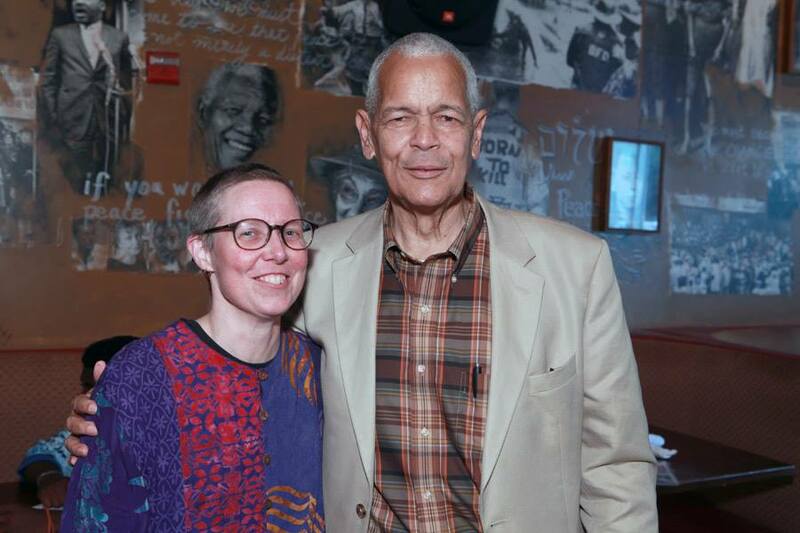 Author Emilye Crosby (left) with Julian Bond. Crosby is a Professor of History at the State University of New York and is the author of Civil Rights History from the Ground Up: Local Struggles, a National Movement. Jeanne Theoharis, who learned movement history in one of Julian Bond’s classrooms and worked closely with him in recent years to open the Rosa Parks Papers to the public, tried to manage her grief by writing, “What Julian Bond Taught Me,” published in The Nation two days after his death. I strongly related to her description of what she had learned from Mr. Bond, and how her relationship with Julian grew from student to colleague and friend. In fact, Theoharis spoke for many and her essay prompted movement historian John Dittmer to ask the OAH Program Committee to add a panel that would give conference participants an opportunity to pay tribute to Bond, reflecting on the many ways he influenced us personally and contributed to our nation’s history. With considerable support from the committee and OAH staff, John, Jeanne, and I pulled together a panel, “Remembering Julian Bond,” which I chaired. The panel was composed of people who knew Bond in different eras and contexts, including film producer Judy Richardson, a SNCC colleague who was a series producer for Eyes on the Prize; author Taylor Branch, whose friendship with Julian went back to 1968 Georgia politics; scholar Theoharis, who took Julian’s class on the Civil Rights Movement as a Harvard undergraduate; historian Hasan Kwame Jeffries, who met Bond at Morehouse College, their shared alma mater; and law professor Timothy Lovelace, who worked with Bond while earning undergraduate, law, and history Ph.D. degrees from the University of Virginia. While we were all spilling over with cherished memories and appreciation for Bond as historical actor, teacher, speaker, activist, and friend, we tried to be brief, leaving time for members of the audience to offer their own tributes. More than 50 people attended and many offered comments and examples that paralleled and extended the panelists’ comments. Judy Richardson met Bond in 1963 when they were both working in SNCC’s Atlanta office, which she described as “a beehive of activity—filled with young people who were changing the world as I knew it.” She highlighted Bond’s Communications work, which included writing press releases about SNCC’s efforts to register Black voters. These were aimed at securing publicity for the project and at helping to protect workers who were being beaten, arrested, and even murdered by white vigilantes and lawmen. (Bond’s last tweet addressed the franchise, observing that “We are celebrating the 50th anniversary of the Voting Rights Act without the Voting Rights Act.”) As a SNCC staffer, Bond also helped craft speeches, like the one delivered by John Lewis at the March on Washington. Richardson emphasized both that the speech was “truly participatory” and that it highlighted economic inequality—an issue Bond spoke out about throughout his life.